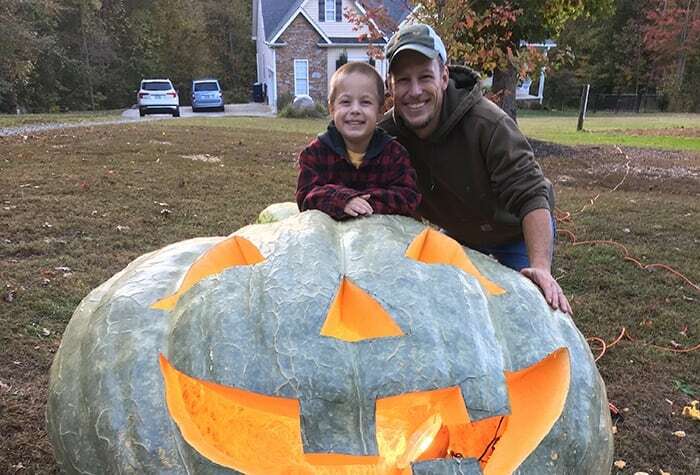 Elijah Meck and his son Owen pose with their prizewinning pumpkin turned jack-o'-lantern. Unlike many of his childhood friends in southeastern Pennsylvania, Elijah Meck, Ph.D., technical product lead for insecticides at Syngenta, didn’t grow up on a farm. He did, however, start working on a farm at age 14. “I may not have been born into the farming lifestyle, but I’ve been around agriculture all my life,” says Meck, who is currently a technical product lead at Syngenta. In ninth grade, Meck took a horticulture class with a favorite teacher. That soon inspired him to join his high school’s FFA, which exposed him to the variety of opportunities available in agriculture. Technical product lead for @SyngentaUS aims to help growers through his love for bugs. Meck was a state winner of the Agri-Science award through FFA for the research project he did with his bees and the varroa mite, a major threat to bees and their hives. This experience helped to convince Meck that he wanted to pursue a career in agriculture. After discovering his passion for entomology, Meck attended graduate school at North Carolina State University. While working as a contractor for a research organization, he realized that the scientific side of agriculture was a natural fit for him. Ultimately, he earned his doctorate in entomology, then started his career at Syngenta, which has allowed him to continue to work in research and development within the ag space. Meck says that being able to think like a grower helps guide him in his current role. Meck often attends speaking engagements where he can merge his focus on helping others with his passion for entomology. Meck enjoys sharing his passion for agriculture with his young two sons on a smaller scale—in the garden at his home in Randleman, North Carolina. Meck and his family particularly enjoy growing pumpkins together. In October 2017, Meck won the North Carolina State Fair’s largest pumpkin contest by growing a pumpkin that weighed 1,458.5 pounds. He also grows large watermelons, though he is yet to win any contests. So far, his largest watermelon weighed 170 pounds. Whether his sons will follow in his agricultural footsteps or not, Meck hopes they will heed his advice. “Always take the initiative to pursue your own dreams because nobody is going to pursue them for you,” he says.